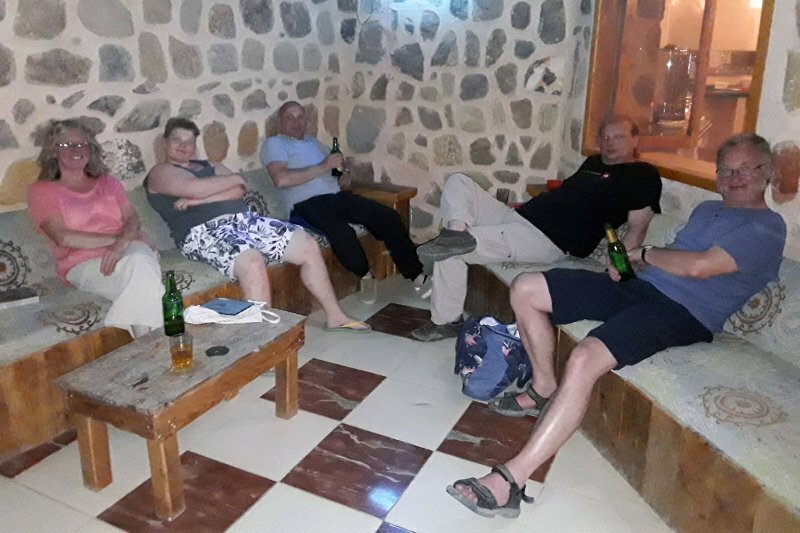 The original plan to go to Dahab was foiled when the government cancelled all flights from the UK to Sharm, So Trevor contacted our friends at Roots Camp (near El Quesir) and we relocated. The organisation and focus on our needs was as wonderful as expected, making it a very pleasant week for us all. We booked 10 guided shore dives at sites along the coast, unlimited house reef diving and soft all-inclusive. We did one guided night dive and one unguided – both fantastic dives, had a trip to “The Rock and El mina” on a zodiac (aka Rib). The winds were strong the first couple of days which made some entries challenging walking along reef tops with waves splatting you is hard work to put it mildly. However the wind calmed down on day 3 and diving became much easier. It was a comfortable 23-25C in the water, we made good use of the package completing a total of 17 dives through the week. The house reef, both north and south sides is still one of the best dive sites we’ve been to. Our other favourite, as last year is Serib Kebir which has caves and caverns to swim through on its south side and a pristine, beautiful reef smothered in colourful soft and hard corals on its north side, as well as turtles! We opted out of another Dolphin watching trip as the chance of seeing them has decreased as a result of rules to protect them from snorkelers (they get into difficulty and then the boats rush in to rescue them, damaging the dolphins in the process!). Instead, on our last day, we went to Abu Daabab, a resort about 1.5 hours drive away where the sea grass is recovering (apparently it almost all died a few years ago) and where we stood a good chance of seeing large turtles. Success! We saw a loggerhead eating jellyfish and a huge green turtle as well as a halavi guitarfish. The turtles were totally disinterested in us so we could get really close. We finished off on with a final dive on the house reef, where we saw crocodile fish, scorpion fish and loads of other pretty fish. We were joined at the dive camp on Wednesday by “Depththerapy”. These people work with injured servicemen (and women), teaching them how to dive when they are missing legs and/ or arms or only have partial use of their limbs! An amazing organisation and they do wonders for the people they are helping – watching someone dive with no legs is awe-inspiring. On behalf of myself, Sammy, David and Jud – many thanks to Trevor and Ann for organising this trip.